In this Fantasy Land, did the Dragons battle! Forged in stone, and forged in Mountain – came Amethyst Dragon. Forged in heat, and forged in rent – came Phoenix Dragon. Forged in clouds, and forged in sky – came Serpent Dragon. It was a Quest for battle, in this Fantasy duel! Three warring Kingdoms, no greener plane. Three clouded visions, no morning Sun. Three duelling Masters, no word of peace. Upon this Fantasy Plane, would their grievances – be settled. Amethyst Dragon: no you may NOT drink from the Waters of this Mountain. Phoenix Dragon: no you may NOT harness the Fires of this Furnace. Serpent Dragon: no you may NOT harvest the Lightening of this Storm. In Powers of Three, did the Dragons meet. Amethyst Dragon: clad in Rock, and clad in purple – Strongest Bite; no chance for flight. Phoenix Dragon: clad in Fire, and clad in orange – Burning Bite; no shield for deflect. Serpent Dragon: clad in Rumble, clad in yellow – Poisoned Bite; no Kingsfoil for cure. In this Fantasy Tale, did the Dragon’s Triumph. Walls in stone, Foundations strong – the rising of a Mountain Power; Amethyst Dragon – bit deep! Sides in lava, Sills in flat – the eruption of a Magma Power; Phoenix Dragon – hot to touch! Clouds in vapour, Horizons turbulent – the rearing up of a Bestial Power; Serpent Dragon – lethal blow! And to the victor? A Dragon City, a Dragon’s Hoard! 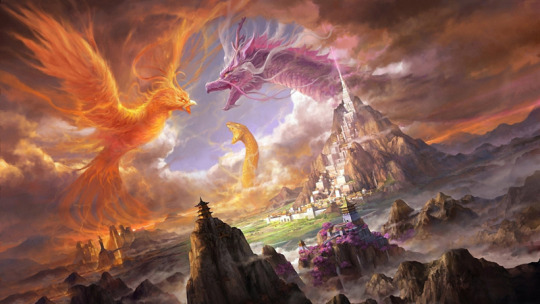 This entry was posted in Fantasy Dragon Art and tagged dragon, dragon city, dragon fight, element, fantasy, forge, mythical creatures, phoenix, serpent, western dragon. Bookmark the permalink.